New York, NY: Carroll & Graf, 1997; $10.95 trade paperback; 220 pp. This review originally appeared in the July 1999 issue (#131) of The New York Review of Science Fiction. Over the past decade or so, Carroll & Graf became a leader of sf reprints by bringing many classics of sf back into print, even if only for a brief period. This army of reprints includes, but is not limited to, Kingsley Amis’s The Alteration, at least three J. G. Ballard books, Ian Watson’s The Embedding, Clifford Simak’s Ring Around the Sun, and Murray Leinster’s The Forgotten Planet. 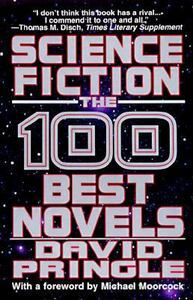 As part of their marketing strategy, Carroll & Graf made extensive use of David Pringle’s Science Fiction: 100 Best Novels for their back cover blurbs; if a reprint made it into his list, then Carroll & Graf made it clear by placing the line “Selected by David Pringle as one of the best 100 novels of all time” on the back cover. Sometimes, the novel itself didn’t even have to make the list; if another of the author’s novels made the list then Carroll & Graf would excerpt a Pringle quote that praised the author in general. It should then come as little surprise that Carroll & Graf is reprinting David Pringle’s 100 Best, originally published in 1985, but out of print for many years. As with many of Carroll & Graf’s previous reprints, a new printing of 100 Best is a something of a blessing. As a critic and as editor of both Interzone and Foundation, Pringle is an important critical voice in the field, and any list he claims represents the best 100 sf novels of all-time demands our attention. The list achieves additional notoriety because of the two-page essays-essays that contain his insights on each novel and its author-on each of his choices. Most other lists, like David G. Hartwell’s in Age of Wonders and James Gunn’s at his Center for the Study of Science Fiction website, give little information as to why particular books were chosen. The reissue of 100 Best comes as an added bonus for those of us who over the years bought novels tagged with the “100 best” line but were unable to find Pringle’s book; we now have a chance to read the reasons for the novels he chose and to see the list in its entirety. For the most part, quibbling with Pringle’s choices for the 100 best seems pointless. As Michael Moorcock points out in his foreword to the book, any individual is likely to quarrel with some of the choices. Moorcock elaborates further when he says, “most readers would agree on at least fifty of the books mentioned here. And that, I think, is an excellent percentage.” To test this statement out, I compared Pringle’s list with David G. Hartwell’s list of 105 most important books of all-time from the 1996 edition of Age of Wonders. Admittedly, the comparison contains a couple of flaws: Hartwell presented a time frame spanning the mid-’20s through the late ’80s, listed 105 books rather than 100, and included short story collections in his list. Nonetheless, 32 novels made it on to both of their respective lists. By removing all the books from Hartwell’s list ineligible for Pringle’s list, you get a list only 75 books long. Based on this shorter list, Hartwell agrees with approximately 43% of Pringle’s choices. A seven percent margin of error seems acceptable. However, Moorcock had plenty more to say in his foreword, much of it not necessarily good. Instead of something that piques the reader’s interest, Moorcock’s foreword comes across as criticism of Pringle’s work. Early in his foreword, Moorcock states, “many of Pringle’s choices are actually readable.” While this statement may have just been facetious, I wasn’t entirely sure. Later, Moorcock points out that the restraint of picking novels leaves out many of the listed authors’ best works, not to mention leaves out authors such as Harlan Ellison who specialize in the short story. He then speaks of his disappointment in the fact that white male authors overwhelmingly dominate the list (which, as he points out, was inevitable given the history of the genre). He does manage to end his foreword on an up note, that the genre has become more diverse in recent years, but the damage was done. While much of what Moorcock says about the genre rings true (some of which needed mentioning), the book should be a celebration of sf: a celebration he manages to dampen. With all this knowledge, it’s almost pointless to argue some of the choices in Pringle’s list. After all, as he also points out in his introduction, such a list is a matter of taste and some long-time favorites might end up excluded for one reason or another. However, it’s still hard to sit down, scan the list and not scream in protest. Where are Larry Niven’s Ringworld, Robert Heinlein’s Stranger in a Strange Land, Kurt Vonnegut’s Slaughterhouse-5, Joe Haldeman’s Forever War, Arthur C. Clarke’s Rendezvous with Rama, Samuel R. Delany’s Dhalgren, and Frederik Pohl’s Gateway!? For many authors, such as Heinlein, Clarke, and Delany, Pringle provides explanations on why some of these titles don’t make the cut. Beyond the explanations, another reason why these and other classics didn’t make the list may be that Pringle’s list has such a strong British flavor. Considering Pringle’s location in regards to the Atlantic Ocean, this is understandable. However, many American readers might wonder why Pringle lists four of Ballard’s novels, three of Aldiss’ novels, three of Heinlein’s, and only one each by Le Guin and Delany. Otherwise, Pringle does not seem to have much of an agenda. His choices run the gamut from hard sf to soft sf, from the literary to those with a heavy sense of wonder, and from the highly polished to some of the somewhat clunky classics of sf. If there is any pattern in his choices, it’s that he’ll choose novels that first explored certain ideas and concepts over those that later explored the same ideas in a different fashion. Interestingly, he didn’t seem to feel it necessary to place limits when picking books by year. True, the quality of the best novels of any given year can vary. But consider that seven of the novels he chose saw initial publication in 1980 and eight saw initial printings in 1953; together with 1964 and 1968, each of which saw six books in his list, 27% of his picks came from just four different years, or eleven percent of the time frame. Just as a point of comparison, the five authors picked most frequently represent just 19% of the choices. However, to be fair, if you break down the list into five-year intervals, the number of picks per period consistently remains between 13 and 16. Another quibble with this reprint has to do with its status as a reference book. Along with the two-page essays for each of his selections, Pringle includes publishing information such as year of publication, publisher of the first edition, and the most recent printing of the novel in both the U.S. and the U.K. This normally would be wonderful information to have. However, since this a reprint and not an updated edition, much of the most recent printing information for many of the books is now incorrect. This is all the more puzzling when you consider that for many of the books, the most recent U.S. printing was released by Carroll & Graf–you’d think that they would have either exerted a little pressure to have that information updated or just removed that portion of the information altogether. I would love to say that the actual essays in 100 Best make all these nitpicks irrelevant, but unfortunately this is not the case. After reading through them, I was left wondering just who the target audience for this book was. If the target audience consisted of people familiar with the genre, then the most of the plot-heavy essays didn’t have enough meat–you were left wanting to know more as to why Pringle felt a particular work was so important. In most cases, his statements placing the novel in the context of the genre were not much more than a paragraph out of the two pages. If Pringle was targeting readers unfamiliar with the genre, then the fact that he gives away so many of the books’ endings is outright frustrating. At least, I found this to be the case for the novels that I haven’t read yet. It’s understandable to give away the ending if that is one of the reasons why a book is special. However, Pringle seems to reveal many of the endings, not to mention quite a few of the surprising twists in the novels, for no other reason than having thorough plot summary. What makes the plot summaries all the more frustrating is that there are a number of essays where Pringle strikes just the right balance of summary and criticism. For novels such as Ray Bradbury’s Martian Chronicles, Pohl and C. M. Kornbluth’s The Space Merchants, and Ballard’s The Crystal World, Pringle’s commentary clearly communicates what makes the novel, and usually the author, so special. He even manages to avoid giving away the endings! Reading these particular essays makes you see why they deserve being on a best 100 list and makes you want to run out and find a copy of the novel, even if it means hunting through numerous used book stores because the novel has been out of print for years. This is in stark contrast to novels such as Theodore Sturgeon’s More Than Human and Brian Aldiss’ Non-Stop, where the essay is little more than a plot summary. Yes, the summaries are written well enough to make the novels sound interesting, but they don’t give reasons as to why the novels are compulsive reading. Nonetheless, even with these assorted caveats, 100 Best should still be a welcome addition for most sf fans. Even though you most likely won’t agree with all the selections, Pringle has pointed out 100 novels that, if nothing else, should entertain their readers and, for those not intimate with the genre, give some insight into its history and progression, at least in the novel form. Despite the plot-heavy nature of many of the essays, he provides readers with at least a minimal reason as to why they should read each of these books. Furthermore, maybe the reprinting of this book will lead to the reprinting of some of the out-of-print titles mentioned within, which is about 40 novels according to the Amazon.com search engine. At the moment, that list includes Bernard Wolfe’s Limbo, Pohl’s Man Plus, Sturgeon’s Venus Plus X and Norman Spinrad’s Bug Jack Barron. If for no other reason, you should check into 100 Best because at least there’s a rationale behind why the novels are chosen-which is more than can be said about the Modern Library’s list of the best twentieth-century novels that came out last year. This entry was posted in Book Review, David Pringle, Matthew Appleton. Bookmark the permalink. Enter your email address to follow Some Fantastic 2.0 and receive notifications of new posts by email.